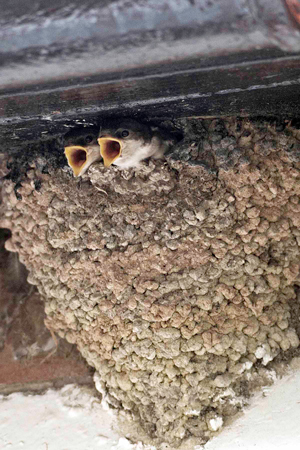 Young House Martins, by John Harding. Launched in the summer of 2009, the BTO House Martin Survey (2009-2013) set out to collect new information on what was happening at House Martin colonies here in the UK. Some 2,537 people contributed to the survey, with many submitting records from their House Martin colonies over multiple years. 2013 was the last year of the survey. The results of the survey were published in a newsletter, copies of which can be download in PDF format using the following links. 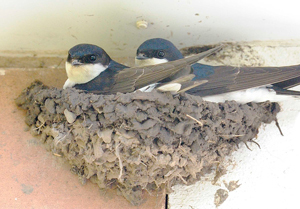 Funding from the 2013/14 BTO Raffle enabled us to carry out pilot work throughout the summer of 2014 to plan and develop methods for a new survey to look at breeding House Martins in more detail than has been possible before. Participants from the successful 2009-2013 survey helped to inform the survey design in order to collect new information on breeding ecology, colony turnover and habitat preferences.